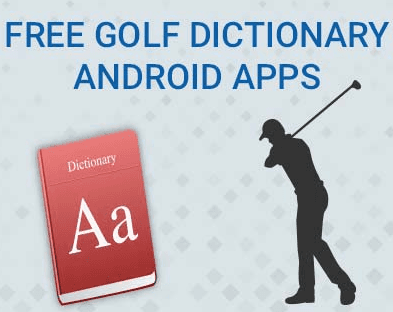 Here are some best free Golf dictionary Android apps to learn common golf terms. In the following list, I will talk about some really nice apps that you can use to learn basic Golf terminology. In the following post, I have added some dedicated Golf dictionary apps and some Golf rule book apps. You can use all these apps to search a particular Golf term and see its meaning and some other information. Apart from looking up the Golf terms, you can learn some basic Golf rules as well to improve your game. If you’ve just started playing Golf then you will need to learn some basics about it. And if you don’t have a teacher with you then you can take some help from these apps. You can see the common Golf terminology and memorize that. Also, you can search for a specific term and see its definition. Not only this, some of the following apps contain the list of Golf rules that will help you too. After advancing in the Golf basics, you can play some Golf lesson games as well to train yourself before actually stepping into the Golf course. Golf Dictionary is one of the best free apps which you can use to learn common Golf terms. Here it is a dedicated Golf dictionary app which you can use on your mobile. You can see the list of common Golf terms and see their meaning, definition. You can see the list of all the Golf terms or you can use the search box to find a specific one. Also, you can use this app to randomly show you a Golf term to help you learn its meaning. It’s like learning meanings and definitions with flashcards and it will actually help you. The app is very simple and doesn’t asks you to create an account. You just install it and then start looking up the different Golf related terminologies in it. From the main screen of the app, you can use the different options to see the different Golf terminologies. You can search for a specific term in the app to see its meaning and definition. Or, you can see the list of common Golf terms as a whole and see the definition of any word that you like. Additionally, there is an option in it to share the definition with anyone you want. Rules of Golf 2019 as the name indicates, it is actually a Golf rulebook. And along with the rules, it consists of a lot of Golf terms and their definitions that might be helpful to a lot of people. 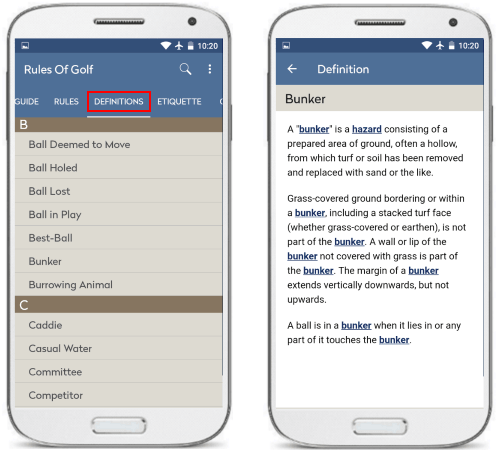 There is a special “Definitions” section in the app which you can use to see the list of common Golf terms and their corresponding details or definition. You can analyze all the terms by simply selecting anyone from the list. Or, you can use the search tool to find any specific Golf term to see its meaning and definition. Apart from the Golf terms and their definitions, you can learn different Golf rules and use the Quiz in the app to test your Golf knowledge as well. To use the dictionary feature, just go to the “Definitions” section of the app after installing it. It shows the list of commonly used Golf terms there and you can select anyone to see its meaning in Golf and its definition. You can understand a lot of Golf basic using this app. And if you want to test your knowledge of Golf, then you can use the Quiz section. In the quiz, you can use different difficulty levels and answer the questions that is asks. 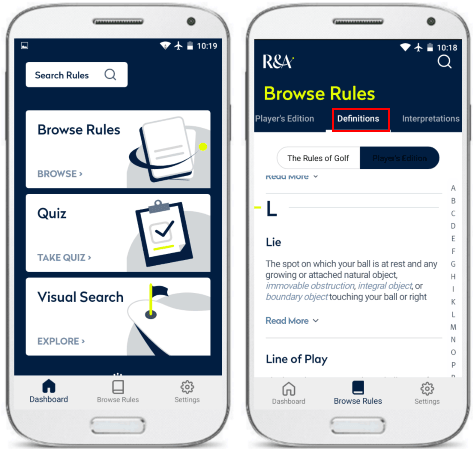 The R&A Rules of Golf is another free app which you can use as a nice Golf dictionary app. And just like above app, it is a complete Golf rule book that you can use to learn and lookup Golf terminologies as well. You can find the Golf terminologies in the Definitions section of the app and then use that. Also, you can search a particular Golf term to see its definition. Along with the Golf terms and definitions, you can read the Golf rulebook as well. There are various Golf rules in this which you can learn and boost your Golf knowledge to a pro level. Simply get the app and start using it to see the meaning and definition of a lot of Golf terms. You can see the list of terms that it has in it and you can also search a specific one in it. Additionally, you can explore other features of the app and learn more about Golf to increase your knowledge. And this app is available in different languages as well that you can configure in the app settings. 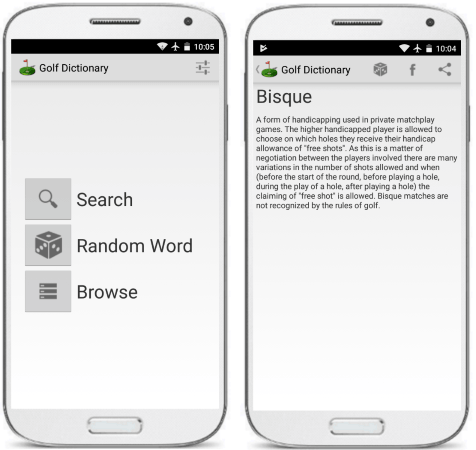 These are the best Golf dictionary apps that I found for the beginner Golf players. Use these apps to learn all about Golf and learn different Golf terms along with their meaning and definition. You can easily use these apps on your Android smartphone without creating an account. Some apps in the above post are simple while some of these are very advanced. You will definitely be able to increase your Golf knowledge with these to become a good Golf player.